To the casual observer, a Reiki table and massage table look like the same thing. What you need to understand, though is that you are dealing with utterly different healing modalities. What are Reiki Panels on a Massage Table? Can a Reiki Practitioner Use a Massage Table? With traditional Reiki practice, the practitioner makes use of the universal life energies as a healing tool. They will scan the body for breaks in energy, or places where the energy seems to be stagnant. It is believed that the subtle energies of the body, when out of balance, make you more prone to illness. So, what a Reiki healing session typically is, is just a way of rebalancing those subtle energies. The practitioner will move their hands just above the skin of the client during a Reiki treatment or Reiki attunement. The idea is not to touch the skin but to tap into the energy fields that surround the client’s bodies. Trained Reiki practitioners will be able to pick up issues such as blocks or imbalances and can work at correcting them. For a good deal of the session, the practitioner can stand upright, and, in those instances, a standard massage table is excellent. But what they decide that they need to give a reflexology session as well? Or work closely with the person’s ankle area? Reiki sessions can take a while to accomplish. It can mean a long time to have to stand on your feet. An alternative is to pull up a chair and get in as close as possible to the person you are treating, where possible, placing your knees on the table. 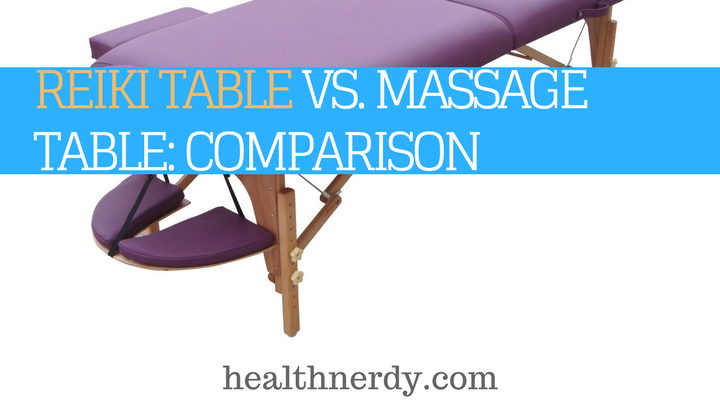 And that is where you find the main difference between a Reiki table and a straight massage table. These are where the panels at the head and feet of the table have been altered to allow the practitioner to fit their knees under the table comfortably. The best reiki tables and reiki tables, in general, ensure that there are no low crossbeams or solid panel at the head or foot of them. This makes it a lot simpler for the practitioner to give the proper Reiki massage. At the end of the day, shows us that a Reiki massage table and portable Reiki tables have a lot in common with your portable massage table. Yes, the short answer is yes. So, if a massage table package is all you can find for your healing practice, you will still be able to do your job. You might need to resign yourself to some uncomfortable sessions when you need to sit down, though. Massage therapists do need to make physical contact with their clients to help relax sore and tired muscles. It can result in a lot of pressure on their portable table and is the primary reason why there is a difference between these and those designed for Reiki. With a portable massage bed especially, the concern is that the extra pressure could make it destabilize. That is why many a portable massage table package includes cross-braces for additional stability. Another area that this healing modality differs is that it may become necessary to zero in on the next and shoulders. It often means adding adjustable headrests or using the table headrest. When it comes to Reiki training and treatments, you don’t usually need to worry about this kind of issue. Contact the firm that you are considering buying from. Check in the frequently asked question section or get hold of their customer service and ask them. Sierra Comfort, for example, is happy to help clients make the right decision in this area. Find out upfront what the table package that you are considering comes with. Can it be altered? How steady with the legs be if it is? Of course, all of what we have discussed above is meaningless unless you have considered your client’s comfort levels. They don’t want to feel the bed wobbling underneath them during their session. Do yourself a favor and invest in the best quality that you can afford, whichever type you are looking for. A top-quality bed won’t be easily destabilized because it is short one cross-brace. Buy from reputable companies and look into customizable options if necessary. It will cost you more to do things this way around. But it is money well-spent. The better quality options are more comfortable and will last longer. They won't have foam that goes flat after a few weeks, and they won't fall apart as soon as the warranty has expired. High-quality products in the market often come with a lifetime guarantee on the bodywork. The foam and upholstery have a more limited liability instead, but this is usually still a few years, rather than months. If you are adamant that it must be one and not the other, consider the primary healing modality that you will be using. If you are not going to offer massage, for example, the answer is easy. However, if you would also like to offer massage, you need to take more care. Check the different options carefully. Read through all of the reviews that you can get your hands on and go from there. Find a bed that most closely fits your needs. If push comes to shove, you could consider performing reflexology with your patients seated on a chair. Getting a bed that does allow space for you to fit your knees under it and that is still highly stable is first prize. There are many options out there that make this a reality. All you have to do is to start looking around. And, now that you understand exactly what the differences are, you are in a far better position to do so.